At Marinoë, they look to the sea for nourishing and delicious food. 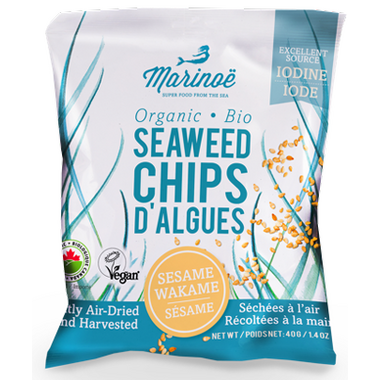 Using innovation and expertise, we handcraft these gourmet seaweed chips from fresh, quality ingredients. They start with organic seaweed grown off the coast of Brittany, France, and harvest it by hand. They add carefully selected, flavourful organic ingredients, then gently air-dry the chips to crispy perfection! lemon juice*, chia seeds* (Salvia hispanica), black pepper*. *Certified Organic.